4-Word Review: He fights against capitalism. 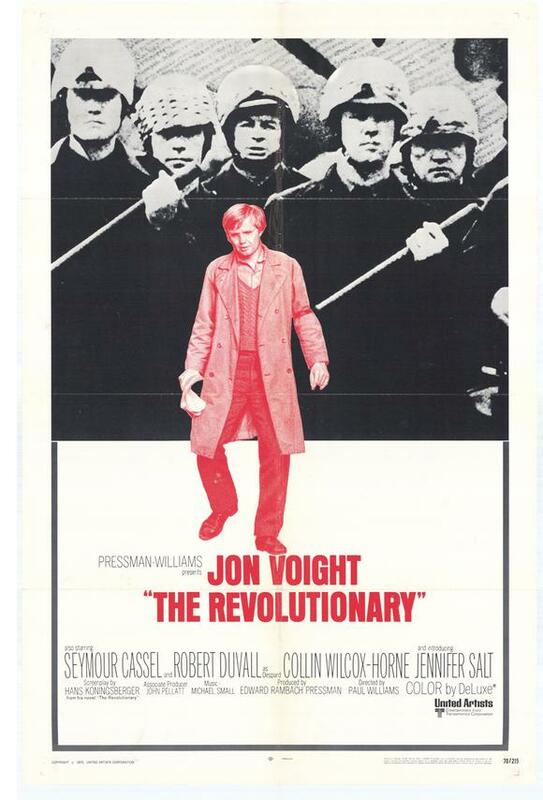 Jon Voight plays a college student involved in a student protest group called The Radical Committee. They push for social change particularly with a more communist/socialist style of government, which he becomes fonder of after working with Despard (Robert Duvall) a nearby factory worker who’s trying to start a union up at his plant. After being suspended from the school for his radical views he becomes frustrated at seeing how his work and actions seem to have very little influence or effect. He then meets up with Leonard (Seymour Cassel) who is a more seasoned radical and not shy about using violent or unethical methods to make his point and pressures Voight to start doing the same. On the whole despite its slow pace this is a slickly produced intriguing character study. I enjoyed the grainy pictures of the 1917 Bolshevik Revolution shown over the opening credits, but I didn’t like the film’s choice of on-location shooting. Supposedly it takes place in a small American city, but it doesn’t resemble one since it was filmed in London, which gives everything from the old buildings to roadways and sidewalks a European look that you never see in any American town or city. There is also no explanation initially about what the students are protesting against or why they are at odds with the school, which makes the storyline seem generic and hard to get into at first. I loved Voight’s character as it is similar to his Joe Buck one in Midnight Cowboy with all of the social awkwardness, but fortunately he is not as painfully dumb. It is interesting to see how such a highly intellectual man with strong opinions and ideals can still at times be quite timid. I was looking forward to seeing the character go through a transition and was disappointed that it took so long to get there. To me the ending should’ve been the beginning and the fact that it isn’t hurts the film’s overall impact. I was also confused as to why the Jennifer Salt character, who plays a young lady from an affluent family, would find Voight so appealing, or why she wanted to continue to go out with him, which to me demanded more of an explanation. The scene in which a mob gets attacked by some riot police is photographed in a way that makes it intense and startling and could’ve been extended even more. The ending is nerve wracking and great example of how complete silence without any music can sometimes create far more tension. Unfortunately the ambiguous resolution is a disappointment and after such a long and deliberately slow build-up comes off almost like a cop-out.